Students of AUR's Food Writing Across Media class were guided around open air markets in Rome's Trastevere and Testaccio districts by Olivia Ercoli. The Food Writing Across Media class kicked off spring break with a tour of Roman markets last Saturday. 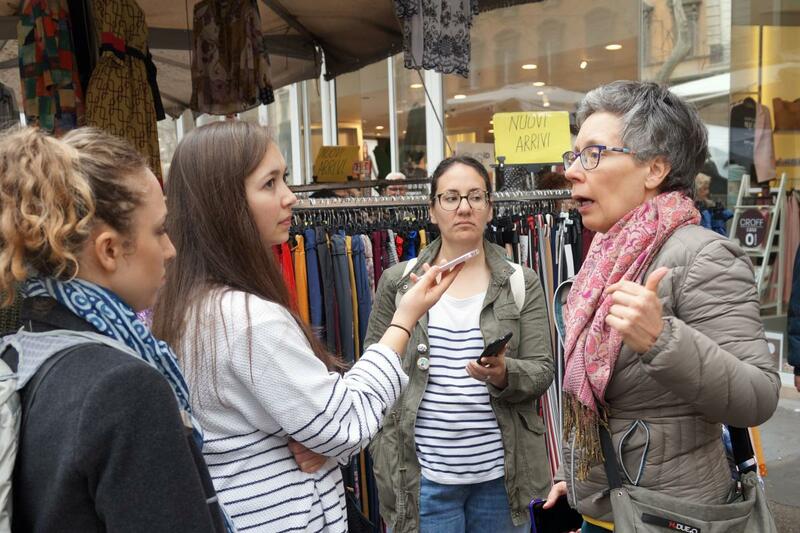 Olivia Ercoli, historic tour guide and guidebook author, led the students from Piazza Trilussa in Trastevere to the Testaccio neighborhood to explain the persisting significance of food and flea markets in Rome’s cultural development. Throughout the tour, students were recording Olivia’s explanations as well as general sounds of the city for an upcoming radio project. Trade has always been at the heart of Rome, which was likely first established as a marketplace to capitalize on the opportunities presented by the Tiber River. The tour began at the open food market in Trastevere, where students learned about the legacy of street vending in Roman piazzas. Olivia explained how the Bolkestein Directive, an EU law passed in 2006 but not yet implemented, threatens to disrupt the tradition of passing market stalls down through the family. The law will set time limits on street vending licenses, such that itinerant traders will have to compete with one another and with private entities for new permits once theirs expire. Although the tour focused on markets today, Olivia peppered in many facts about the city’s history, such as how walls of Porta Portese were first built to protect the papal naval shipyards by the Porto di Ripa Grande. In Porta Portese, home to a famous Sunday secondhand market (known as the place where all stolen goods can be found for sale), Olivia discussed the gypsy presence and immigration politics in Italy. The group then crossed the Tiber into Testaccio for their final stops at a former-abattoir, Il Mattatoio, and the trendy food hall, il Mercato di Testaccio. Both of these renovated sites represent the interweaving roles of food and history in Rome’s cityscape: the slaughterhouse has been converted into an art and education facility, while the market lies on top of ancient ruins and offers a mix of Roman culinary staples, street food, and international fusion. The excursion was a chance for the M.A. students to integrate Roman history into their studies. They will be using their knowledge and recordings from the tour to create a radio piece about changes in the city’s food system and in Rome as a whole.